Famous games dev siblings The Oliver Twins have just released a NES title which was assumed lost many years ago. Wonderland Dizzy - an entry in the beloved platforming series the brothers originally created for the likes of the ZX Spectrum and C64 - was produced during the early '90s but never saw the light of day on Nintendo's popular 8-bit console. The source code for the game turned up a few months ago when the twins were preparing to do a talk at the UK gaming event Play Blackpool. A map for the title was discovered, prompting Philip Oliver to search his loft for the source code - which turned up on a single 3.5-inch floppy disc. The disc didn't contain the final, finished game, but it did have the source and the visuals, and after hooking up with Polish Dizzy fan Lukasz Kur, a working ROM image was forthcoming - and you can now play it online for free. 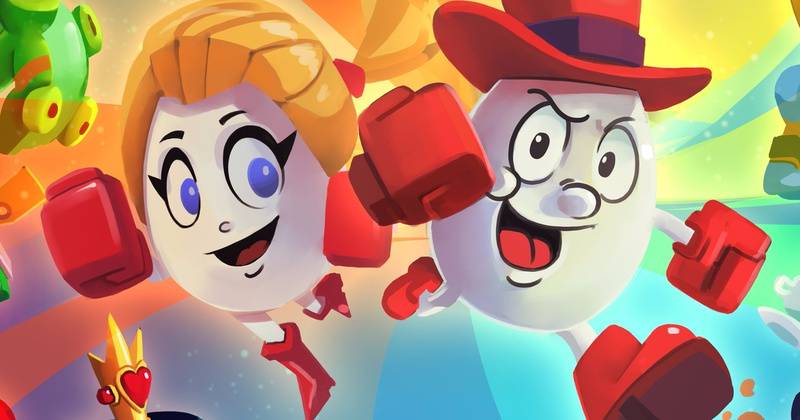 However, fans of the Dizzy franchise might not want to get too excited, as this release doesn't mean the Olivers are working with the egg-shaped hero once more. They're currently committed to their latest game SkySaga, and a while ago a crowdfunding campaign to raise money for an all-new Dizzy failed. Surprising but brilliant news. I know what I'll be doing this morning. Wow, I loved Dizzy on the Spectrum and later on an Einstein PC! Cassette tapes and DOS for loading back in the day. Loved Dizzy back in the day.Treasure island Dizzy and Fantastic World Dizzy are the 2 that come to mind although I'm sure I had the original 'Dizzy' as well.I'm sure TI Dizzy was the first game I ever actually completed.I'd have been around 10 at the time. Never expected this to happen. Always wanted to try out one of the games. My, my, there sure are a lot of forgotten retro platformer heroes. Played quite a bit yesterday and I had forgotten the wonderful feeling of being stumped in a world where the Internet and GameFaqs can't help you out. I remember these games but I don't recall ever playing them. Love Dizzy, Dylan, Dozy, Daisy et all. They are each the names of my player characters in New Leaf also. Fantasy World Dizzy is a classic!!! I hated Dizzy, he just never did what you wanted him to do........ but I do miss games on cassette. saturday afternoon you and a friend buy 2 different games, pop in to boots to get some C90's ...... to the youngsters on here that means nothing! @MJKOP really LOVED flimbos quest on the c64! Haven't played it since then. I've tried to get a c64 emulator working on a pap but I'm lost as soon as I load the emulator up. Love to play that and dizzy on my psp. Think Dizzy is due a reboot. I've got a ZX emulator working on my DS via an R4 if you have one. For Dizzy games you would want the Amstrad emulator also via R4 - the Spectrum Dizzy roms are hard to find. Not sure about commodore emulation for DS, I was always a Speccy kid. I wonder if this will pop up in the reproduction market. Woah, Dizzy! I actually remember that guy! Played this for about an hour yesterday. VERY challenging. And as @Shiryu mentioned, no GameFAQs or Let's Plays exist (yet), so I was totally on my own. This would have been a memorable if not very high-replay-value NES title, had it ever made it to market. Correct me if I'm wrong, but no Dizzy title was ever released on a Nintendo platform, correct? @Fandabidozi hmm, well if that emulator works with r4 then there has to be the same kinda ZX emulator for the psp. Gonna look into it this week and play some Flimbos Quest(finally) and Dizzy. Ah the olden days of platform games were great! Oh man! I use to play dizzy on my genesis all the Damn time! @JJtheTexan Incorrect. Fantasic Adventures of Dizzy, Dizzy Prince of the Yolkfolk (under the name Dizzy the Adventurer), Treasure Island Dizzy (on the Quatto Adventure cart), and Go Dizzy Go (on the Quattro Arcade Cart) were released for NES. @brianvgplayer huh! I'm guessing most of those were released in Europe / PAL only. Never heard of any of those titles on NES. @JJtheTexan ...hmmm, it's not easy to explain this one, but yes, some other Dizzy made it to the NES. @JJtheTexan They were released in the US. I have Quattro Adventure on cart and I have seen Fantastic Dizzy in stores. I used to see ads for them in magazines like EGM too. The cart shape of Codemasters NES games is different since they weren't licensed by Nintendo. Darn, I was hoping there would be a ROM. These two never fail to be absolutely delightful. And as someone who loved Dizzy on the C64, despite being rubbish at it, I'm pretty stoked about hearing of a new classic entry! @StraTTtheRipper There is. On the play online page there's a download link for the ROM at the bottom as well as boxart and cart label images. I had one Dizzy Game, though a bit of an oddity, it was on a weird thing that looked like a Game Genie, and required another game plugged into it to work. I forget which one of was. All I remember was that there was a leprechaun all the way to the left. I think the last boss also required a mirror to defeat, but that was from a guide, never reached the end myself. Loved Dizzy on my ZX Spectrum. Still play them occasionally. @ChessboardMan I had that Dizzy game connected to another cartridge and a game genie. It stuck out the front of my NES quite a distance and I think that's what eventually broke it. Today I learned about the Dizzy series! @ChessboardMan Some Codemasters carts were available for an accessory called the Aladdin Deck Enhancer, as well as a version on a stand alone NES cart. Dizzy the Adventurer is only available as an Aladdin cartridge.